Hey, friends! 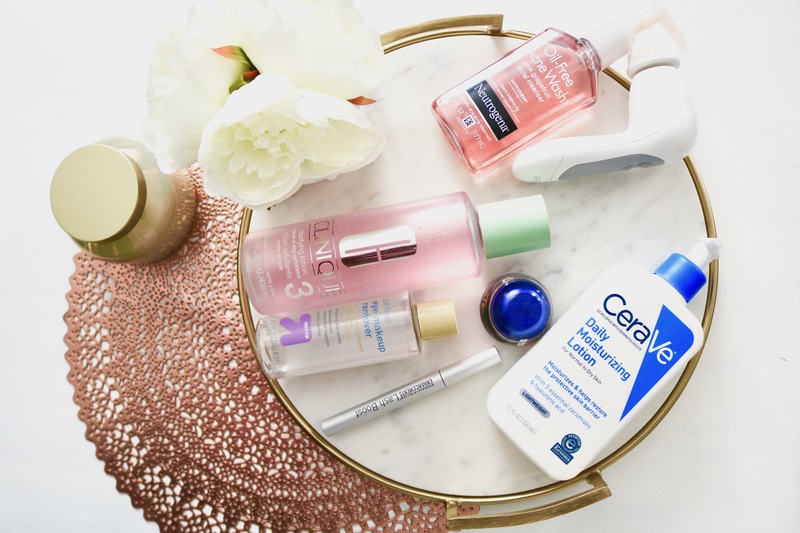 Today I’m showing you my current skincare routine, including some of my longtime favorite products and a few I’ve been loving lately. For reference, I have oily, acne-prone, and fairly sensitive skin. Products that are overly fragrant don’t work for me, and it’s taken some trial and error to find a routine that works. I wear makeup almost every day, but I shy away from using foundation or face makeup beyond concealer and powder daily to let my skin breathe. I’ve been using Target’s Up&Up eye makeup remover and Clinique facial cleansers for years! I recommend both for sensitive skin and eyes. Many makeup wipes tend to irritate me, but these products are my daily staples. I use cotton balls or cotton rounds to remove eye makeup first and then remove any remaining product from my skin, before I shower and move on to step 2. Let’s be real, this is a step I haven’t always been the best at. (Yikes, I know!) But, I’ve gotten much better at caring for my skin. With struggling for acne for so long, it seems like ‘skincare’ didn’t help no matter what I did or what products I tried! Now, I usually use a Neutrogena foaming cleanser, or a mix of whatever cleansers I have in my shower at the moment. I added this Olay Pro-X electric cleansing brush to my routine about 3 years ago, and I’m so glad I did! I researched similar brushes before settling on this one. It’s lasted me 3 years (only having to change the batteries maybe once?) and is going strong! I don’t use this brush daily, maybe 2-4 times a week, or whenever my skin is needing a refresh. I use this with my regular cleansers, and it’s great for removing dry patches or flakiness from breakouts. Having oily skin, this was another step I didn’t understand the importance of until recently. I know it seems like a no-brainer, but it didn’t make sense for me to add more product to my already-oily skin. Moisturizing is an important step, especially in the drier months, to keep a healthy balance to your skin! I use the CeraVe daily moisturizing lotion at night over my whole face. One bottle lasts forever! A recent addition to my skincare routine is eye cream. I never had issues with dark circles until recently, and it definitely varies with my quality of sleep. VIIcode was kind enough to send me their T2 Oxygen Eye cream to try, and they’ve sponsored today’s post in part. The T2 cream has a refreshing scent and isn’t overpowering at all (like I said, I’m sensitive to scents! ), which I appreciate. I’ve been using this nightly for about a week, and I’ve already noticed improvement in the dark circles and dryness under my eyes. Another recent addition to my routine! While lash serum isn’t technically skin care, I’ve been using this before bed after my skincare routine, so I wanted to mention it. My mom saw such great results from the Rodan & Fields Lash Boost, I wanted to try it, too! She gave me a tube for my birthday, and I’ve been using it for about a month. I’ve noticed some growth in my lashes already & plan to keep using it. Rodan & Fields is on the pricier side, but there’s a variety of more affordable lash serum options. I recommend doing your research to find one that works! That concludes my current skincare routine! I hope you enjoyed today’s post. I’d love to film a ‘night routine’ or makeup routine video if you’re interested. I shot these photos in the morning (on my own using a tripod! ), which is why I’m wearing makeup while talking about taking makeup off. Comment below one of your favorite skincare products! Do you have any product recommendations for oily/acne-prone skin? I’m always looking for new products to try! You are so pretty.. I’d love to have such a gorgeous skin tone you have.. Moreover, your looks are terrific as well. I’ll definitely follow you recommended Skincare Routines from now on.